A group of Hong Kong residents have placed an advertisement in a popular tabloid calling people from mainland China ''locusts''. The full-page advertisement in Apple Daily was funded by donations from a web-based group. The term is an insult commonly used on the web by some of the city's residents to refer to mainlanders. 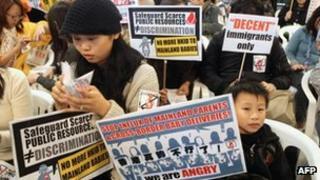 It comes as tensions escalate in Hong Kong over China's increasing influence and the influx of mainland visitors. The advert, which warned of possible social conflict, contained lines such as "Hong Kongers have had enough!" and "This city is dying, you know?". The donors, who raised more than HK$100,000 ($13,000, £8,200) for the advertisement in less than a week, also called for the government to stop the ''unlimited infiltration'' of mainlanders. "Why are mainland mothers flooding in to take up resources in public hospitals, getting our benefits and social welfare?'' one of the organisers of the campaign told the South China Morning Post newspaper. ''Why do mainlanders... refuse to follow our rules and order? We can't accept that," said the man, who used the alias ''Yung Jhon''. Tensions erupted last month when Dolce and Gabbana allegedly banned locals from taking photographs outside its Hong Kong flagship store, seeming to show a preference for wealthy mainland shoppers. The Italian fashion label later apologised but the incident sparked off a flurry of furious reactions from Hong Kong residents. An influx of mothers travelling from the mainland to Hong Kong to give birth to obtain rights for their children to live and work there has also irked the city's residents. The issue is a battle for resources, says the BBC's Juliana Liu in Hong Kong. In part because of its British colonial legacy, Hong Kong is believed to have some of the best healthcare and education in China. Hong Kong was returned to Chinese rule in 1997. The ''locusts'' advertisement follows recent controversial remarks made by Peking University professor Kong Qingdong. He called Hong Kongers "bastards" and "running dogs of the British government" when commenting on an earlier incident in which a mainland Chinese girl was reportedly told off by locals for eating on a Hong Kong train.